The mounding Gaillardia Celebration will bloom in your perennial garden from early summer on to fall. Growing 15 inches tall and spreading out to 14 inches wide, the beautifully elegant red flowers of this Blanket Flower hold their color for a long period. Spent blooms can be deadheaded to encourage continual flowering. Gaillardia are ideal for planting in containers, flower beds and using as a low hedge garden border. Celebration Gaillardia thrives in hot, sunny areas and is drought tolerant once established. Colorful companion plants for the Celebration Blanket Flower are the Moonshine Yarrow, Snow Cap Shasta Daisy, and Veronica Royal Candles. 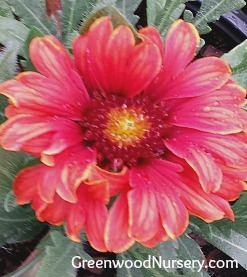 Sunset Celebration Gaillardia is grown in a one gallon container. Orders shipping to AZ and CA will be bare rooted before being prepped for shipping.